The Sette 270 Wi introduces two revolutionary design innovations to espresso grinders and enables incredible functionality for home users. This machine is the first – and currently the only – espresso grinder offering grind-by-weight functionality directly into a portafilter. Precise, accurate dosing to within a few grams (2- 3 beans!) directly into your portafilter makes quality, consistent espresso a breeze. The mouthfeel and flavor clarity of espresso pulled on the Sette out-classes other home espresso grinders. The multitude of features offered by the Sette makes dialing in espresso simple and hassle-free. Thirty steps of macro-adjustment and a fully stepless micro-adjustment system gives the user a near-infinite number of grind settings to allow for the best, most precise dial-in on any Baratza grinder. This allows room for even the most attentive taster to explore delicate layers of sweetness, acidity, and body for all types of espresso from classic Italian dark roasts to progressive light roasts. The Sette excels at fine grinding up to and including small, single-cup pour-overs. The Sette features our radically redesigned gearbox and burrset in which the outer ring burr rotates around a stationary cone burr. This design allows for high-speed grinding – up to 5g per second – as well as minimal retention of coffee in the system. Most burr grinders utilize a small pathway through which ground coffee passes. On the Sette, coffee simply falls from the burrs down into your portafilter. The machine is equipped with a digital scale utilizing Acaia technology that holds three adjustable and precise presets. This allows you to save three different dose weights for a variety of uses. In line with Baratza’s focus on process improvement and quality, we have made significant improvements with the weight accuracy and repeatability of the 2016 award-winning Sette 270W. This updated grinder, the Sette 270Wi, was released April 2018. The "i" in 270Wi stands for intelligence - the grinder now quickly calculates and predicts the stop point when you change your grind setting, beans, or dose weight. This eliminates the need to adjust the offset. The new 270Wi maximizes its built-in Acaia high precision scale by filtering unpredicted vibrations that could affect dosing accuracy, such as door closures, footsteps, unsteady surfaces. A "quick burst" feature allows you to add small increments of coffee to your final dose after the grinder has stopped. In the event of a software update, it can be installed wirelessly via the integrated Bluetooth using Apple phone or tablet. 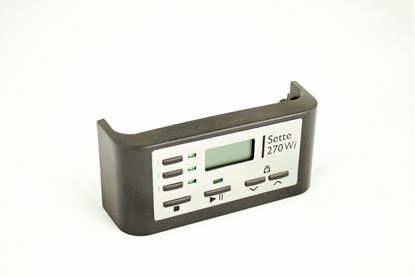 Recent versions of the Sette 270W are upward compatible to the Sette 270Wi, by purchasing and installing the new 270Wi Display panel and then updating the software via an Acaia App. Straight-thru vertical grinding of the beans (highly efficient and results in minimal residual coffee in the system). Manufactured by Etzinger in Liechtenstein, the Sette 270Wi is built with 40mm conical AP (all-purpose) burrs, which produce weight-based espresso grind, as well as grinding for manual brewing requiring a finer grind range (e.g.weight-based Aeropress and Hario V60). They grind coffee at 3.5g to 5.5 g/sec. depending on the roast and the setting. The burrs are durable and will remain sharp for many years. A built-in convertible holder, unique to the Sette Series, allows you to grind directly into your portafilter, the supplied grounds bin, or most of the popular brewing devices (V60, Clever, Kalita, etc.). The rubber sleeves on the arms are fully rotational allowing you the option to position them in a way that best suits the tool/brew-method you are using. The arms can accommodate portafilters from sizes 49mm to 58mm and the holder includes an integrated hook for stability. This grinder was designed with a built-in scale using the weighing technology of Acaia, giving precise and accurate weight-based dosing, and a 10th of a gram sensitivity. The 270Wi has the revolutionary ability to grind by weight directly into a portafilter - a breakthrough in grinding technology! This unique grinder design responds to the Specialty Coffee user trend of using specific weight based recipes for coffee preparation. A user-friendly front mounted control panel has an easy to read backlit LED display. Three programmable buttons allow for grind weight setting within 0.1 gram. Simply press the start button and the Sette automatically delivers precise dosing. The Sette has a macro adjust of 30 steps, grinding from espresso to manual brew. A step-less micro adjust with 9 indicators, allows the user to easily dial in a perfect espresso. The macro/micro mechanism is directly connected to the cone burr resulting in immediate and true grind adjustment. The Sette Series is designed with a small footprint (like our other models) ideal for home kitchens, offices, brew bars and catering. To maximize freshness, the Sette minimizes the ground coffee left in the grinder. A powerful, high torque DC motor drives the Sette. The circuitry is equipped with an automatically resetting, thermal cutoff switch. An extension that can add 275g of capacity to the existing bean hopper. Several extenders can be added to get to the capacity you need. We offer a second burr assembly-the BG (brew grind) burr that improves grind profile for brew methods requiring a fine to mid-coarse grind. Replacement display assembly for the Sette 270W to upgrade it to the Sette 270Wi. This part is compatible with all Sette 270W’s but does require an update to the grinder’s software pack to function correctly. See details below for more information.